As with any technology, the cell phone is a two-edged sword. Had cell phones been available when I was first learning to drive, I am sure that my parents would not have let me out of the house without one. I certainly made sure that my teens had one, especially after they got their driver’s licenses. I remember having had my share of minor accidents and car trouble during my teen years and what a helpless feeling it was to have no way to call for help. It gave me peace of mind as a parent to know that a cell phone could help keep my teen safe if their driving careers were to start as inauspiciously as their old man’s. While there’s no way to say this without you hearing a “back in my day” codger, I’m saying it anyway. In my teen driving days, using the phone while driving meant driving around until you found a pay phone. I can’t tell you how many times I may have made it home before curfew if I had not spent the time searching for a phone to call to tell my parents that I might be late. Today’s parents no longer worry about the necessity of their teen driver finding a phone, but that they instead will find ways to stay off of it. The teen years are equipped with a sense of false bravado that can convince a teen that he or she is invincible or bulletproof. They believe there is nothing that they can’t do and, since they can text simultaneously with every other activity in their life, how hard could it be to do so while driving? Stories of texting and driving tragedies are an increasingly regular component of the evening news. 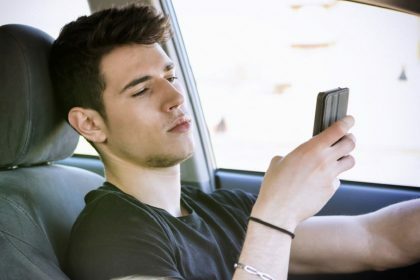 While teen accident rates were high when I was first driving, those numbers continue to rise and studies show that cell phones and their use are to blame. To help ease parental concern, there are now apps targeting these concerns. These apps are designed to make the cellphone something used in case of emergency instead of being the cause of emergency. While there are dozens of options in the app stores, here are a few of the leaders. TxtBocker – This app enables the user to disable texting function during certain times of day. Teens tempted to text can perhaps wean themselves from this compulsion by scheduling themselves a texting blackout during their drives to and from school. AT&T DriveMode – When activated, this app will auto-respond to all incoming calls or texts with a message that the person they are trying to reach is driving. LifeSaver – This app does a little gamification to make it more attractive for teens to use. Consistent use can earn prizes such as iTunes credits. The developers have also published a heatmap showing the areas of the country where texting and driving are the most concentrated. If the map is accurate, a trip to the site can be a little unsettling or, at the very least, eye-opening. Down for the Count – This iOS only app provides users the opportunity to create safe driving campaigns to which supporters can pledge donations. If the campaign creator fulfills the requirements of the campaign, they receive a portion of the proceeds. TrueMotion – TrueMotion offers two apps. The first monitors a drivers behaviors and offers incentives and advice to encourage better driving. The second allows another party (like you, parent) the ability to watch how well the driver is following the advice remotely and in real time. I would have welcomed this “teen driver tracker” during my kid’s early days behind the wheel! If you have a teen driver, consider getting one of these apps to increase their chances of staying safe behind the wheel. You may even want to look into them for yourself. 40% of teens in a recent survey admitted that they had been in the car with a driver using technology in an unsafe manner. While I have finally learned while running with scissors is not a good idea, there are times I still consider myself to be Superman behind the wheel.